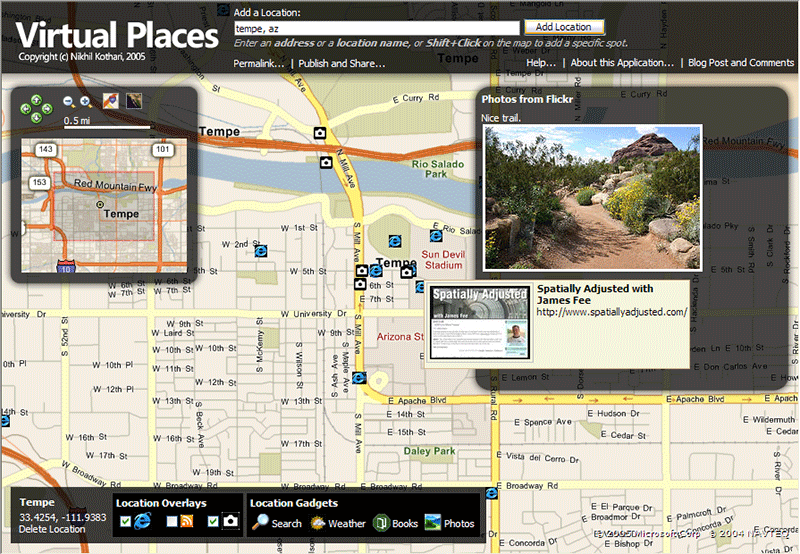 Virutal Places is a mashup of Virtual Earth, and various web services (including Amazon, Weather.com, Flickr, Feedmap, GeoBloggers, GeoURL, MSN Search and MapPoint). The app brings the concept of gadgets (ala live.com) in the context of a map. Gadgets can not only consume your current view, or selected locations, and bring in interesting data about that spot, but also contribute locations of interest and allow the user to add more, thus creating an immersive mapping experience. I’ve been playing with this for a couple days and I’m very, very impressed with its look and functionality. Nikhil goes into some depth on how he created the web application on his blog, and it is unfortunate that this only works on Internet Explorer. A great example on how to create a very impressive AJAX application, but also a good example of why the Flash interface does have its advantages.